After recovering (at last!) from rotator-cuff surgery on both shoulders, I recently began swimming after a two-year absence from the pool. Swimming at least halfway decently is one of the best ways to build upper-body strength. And for me it makes a nice, mind-clearing change from the pavement pounding of running. I decided start by reviewing the breast stroke, because it’s much easier than freestyle. After such a long time away, I really had to think through what I was doing with my arms and legs and how often to breathe. Like running, swimming involves your whole body. But unlike in running, you can’t just send a knee forward to get there. So what leads your body—or a fish’s body—through the water? The crown of the head. Once I started thinking about the crown of my head leading, it was easy to think of my head leading my neck and the rest of my spine as a single unit, right down to (yes!) my tailbone. After all, we and the fish have somewhat similar skeletal structures—head, spine, limbs (or fins), and tail. And once I started thinking about my head and spine as a unit, my arms and legs suddenly felt a lot more like what they actually are—appendages branching off from my trunk, not attached to it with some kind of mental Velcro. My swimming even got a bit easier too, and the water almost seemed to flow past me, instead of me trying to get through it. I alternate swimming days and running days, so I wanted to see if this kind of thinking would work on land, too. Could I think about my head leading, even though my body was perpendicular to the ground? I had to keep returning to this thought, but as long as I could keep looking a bit farther ahead than I’m used to, my head felt light and free on top of my spine, and my arms and legs moved a bit more easily. 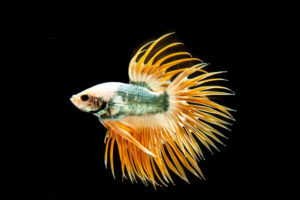 Try this: The next time you’re out for a run, think about the most beautiful fish you can imagine—a speckled trout, a zebra fish, or even a Siamese fighting fish like the one here. That fish’s structure is similar to yours. Imagine your inner fish moving through the air the way a real fish moves through the water. You’ll lose the thought every so often, so just renew as necessary—no need to overthink this!